One of the greatest Causes of the Cold War was the ideological, political, and economic differences between the society and government of the west and that of the Communist system used in the Soviet Union. 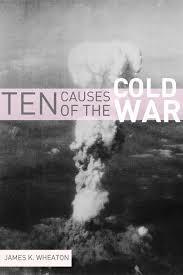 This is a topic suggestion on Causes of the Cold War from Paper Masters. Use this topic or order a custom research paper, written exactly how you need it to be. There were numerous factors that led to the outbreak of the Cold War in 1945, immediately following the end of World War II. The greatest contributing factor to all this was the ideological, political, and economic differences between the society and government of the west and that of the Communist system used in the Soviet Union. This difference would lead to dramatic foreign policy positions that would shape world affairs for the next four decades. Americans, on the whole, were afraid of Communism. As a capitalist, democratic society, they did not understand how a government could restrict free market enterprise and be governed by one political party. As the Soviet Union became increasingly powerful, Americans were afraid of the continued spread of this system, ultimately fearing that it would become a direct threat to the way of life that we as a society held dear. Further, in the treaties that brought an end to World War II, freedom was promised to the nations of Eastern Europe, giving them the opportunity to democratically choose what system of government they wanted to have. Stalin, however, as leader of the Soviet Union, broke these treaties and did not allow for fair and accurate elections, installing Communist governments regardless of the people’s wishes. America had harnessed the power of the Atomic Bomb and used it on two Japanese cities at the end of the war. Russia sought to create a secure western border that would prevent future attacks. The ensuing tensions between the two global superpowers would result in a period of time today known as the Cold War. When the Cold War erupted, it assumed a completely different style of wartime behavior. Instead of fighting with physical weapons and assaults on specific geographic locations, but the United States government and the Soviet government sought to control the minds of the people. Both sides used propaganda in order to attempt to influence their populations. Words and images replaced guns and missiles. In order to show patriotism, residents were socially require d to express their own hatred for the alternate country. This could take place in a number of different socially or governmentally predetermined manners and aspects. If such an expression was not made, and worse if they residents sympathized with the other country, they were socially ostracized at the very least. “Most persons regard the Cold War as essentially an ideological war”. Propaganda was the main instrument through which the war was fought, and this was true of both sides in the war. In America, Washington D.C. and the political leaders there seemed to wonder, as the country moved on from the impact of the World Wars and into the environment of the Cold War, what propaganda could do for them strategically. Journalism and News was replaced with propaganda. The paradigm for the propaganda had its roots in military and militaristic needs and desires. This would go on to require “the testimony of leading editors and journalists to evidence propaganda’s utility. This model placed propaganda operations in the hands of multiple news outlets”. When this failed abroad, despite the domestic success, the journalism paradigm was replaced with the militaristic paradigm. The problems between the countries and the methods through which they fought would continue throughout the next few decades and many people would become fearful, caught up in the mob mentalities that the propaganda supported. Propaganda was fashioned as a “statute for military involvement”. This was done, supposedly, in order to help spread “the truth about the United States” to international areas through news in order to help reduce the risk of war. It was promoted that this would then help the nation to avoid a high increase in taxes and an inevitable need to cover the payment for a billion dollar military task force, which would be the result of war. Afghanistan and the Cold War - Afghanistan and the Cold War research papers evaluate the influence of the Soviet Union on Afghanistan. Game theory in the Cold War - Game Theory and the Cold War research papers scrutinize the use of game theory against the soviet union. Iron Curtain Speech - Iron Curtain Speech research papers discuss the speech given by Winston Churchill, the Sinews of Peace speech. Iron Curtain - Iron Curtain research papers discuss the symbolic divide between communist Eastern Europe and democratic Western Europe that characterized the Cold War. Slacks and Calluses - After WWII everything that this country did, both domestically and internationally occurs within the context of the Cold War. Winston Churchill Iron Curtain Speech - Winston Churchill Iron Curtain Speech essays discuss the address given by Churchill, the “Sinews of Peace” speech, at Westminster College in Fulton, Missouri. Warsaw Pact - For almost fifty years, the Warsaw Pact was a fact of the Cold War. Joseph Stalin - Cold War Time line research papers explain the events from the beginning and conclusion of the Cold War. War in Iraq - War in Iraq research papers illustrate that firm lines have been drawn between supporters and those who oppose military action. Iraq War Coverage - Iraq War Coverage Term Papers delve into an example of an order placed on the comparison of the different types of media covering the war in Iraq. Saddam Hussein's Leadership - Exactly a decade earlier, in September of 1980, Iraq went to war against Iran. Gulf War - Gulf War research papers write on the Iraq and Kuwait and President Bush's US military build-up. Kurdish People - The Kurdish minority in Iraq, encouraged by Saddam Hussein's defeat and American rhetoric calling for his removal, rose in revolt. Paper Masters writes custom research papers on Causes of the Cold War and discusses the numerous factors that caused the Cold War.